RUSH: We’ll go to San Diego. Robert, great to have you, sir. You’re next. Hello. RUSH: Whoa, whoa. Hold it a minute now. See, you’re falling into a trap already that I’m gonna get in trouble for pointing out. Don’t take this the wrong way. I don’t mean this as criticism, but look at how easily you equated “justice” with the cop being found guilty. RUSH: You said the family wants justice and a conviction, but we don’t know that that’s what justice is. CALLER: Well, Rush, I think the Democrats ultimately hope that the robbery, the video and so forth, clouds up the issue enough so that there will be no conviction and there will be an exoneration perhaps. And that’s what the party really wants, because that is the Ferguson get-out-the-vote campaign. A conviction, that’s nothing for them. That’s maybe what the family would like, but the Regime wants just the opposite. CALLER: An exoneration of a white cop would go a lot farther for them, and that’s the political part that I think they’re looking at, and it’s looking more and more like that may be the outcome. The low-information crowd doesn’t get that it’s the Democrat Party and the media defining, politically, the template, the agenda, the narrative of the day. Now, in this case… In this case the way this works is, the way the Democrat Party has constituted itself, they really can’t lose no matter what happens here, politically, because they’ve already succeeded by establishing the myth. It’s worked, which is why I’m trying to point it out so that some people will stop being negatively affected by this in the political sense, ’cause I know a lot of you probably say (sigh), “Oh, jeez here we go again, right before the midterms this happens. Oh, people are gonna hate the Republicans.” So their mythmaking has already worked. Now, I contend to you that any outcome here they will be able to spin for a political victory. It’s the nature of the beast, and the reason they’re able to do this so easily is the Republicans simply do not play. The Republicans are constantly totally on defense without ever once pushing back or going on offense. So in the case of an acquittal, if it goes to trial, an acquittal of the cop is made to order, for one political enemy. The conviction of the cop is made to order, perfect and so forth. An acquittal of the cop, same way. Your point is that they gain more politically with an acquittal because the black community is therefore more riled up. But the black community can’t vote any more Democrat than they already do! So the Democrats and the media? Even if the cop is convicted, I can guarantee you what the narrative of that will be. “Don’t be happy. This doesn’t change anything. It won’t solve anything. The Jesse Jacksons and the Al Sharptons, they don’t want this solved. The people who live on and profit from the notion that there’s racial strife worsening in this country, they’re not gonna ever allow any perception that the problem has been solved. Never. RUSH: Back to the audio sound bites. What a farce. 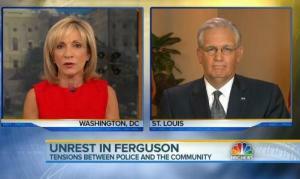 The governor of Missouri, Jay Nixon, on Meet the Depressed Sunday morning. Yeah, I was gonna play this, until I got sidetracked by my memory of Snerdley walking in here today telling me that I should feel responsible for David Gregory losing the hosting gig there. NIXON: Yeah, we in our security team and the highway patrol did not know that was going to be released. I don’t think the attorney general knew that. And quite frankly, we disagree deeply. To attempt to, in essence, disparage the character of this victim in the middle of a process like this is not right. It’s just not right. And secondarily, it did put the community and, quite frankly, the region and the nation, you know, on alert again. And that action was not helpful. RUSH: This just illustrates how backwards all of this is, and it illustrates the myth making. There’s no better word for it than myth, narrative, template, what have you. Why would a videotape of the gentle giant committing a crime in the convenience store, why is that character assassination, why is that incendiary? No, no. Folks, I understand. I know that in powder keg situation like this, I know how it’s gonna be interpreted. That’s my point. There was no doctoring. If this were made up, if they had created a video out of nothing and made it look like it was Michael brown, but it wasn’t. And if they had gone to great lengths to smear Michael Brown, then, yeah. But this really happened. He really did hold up the convenience store. And it added information because up until this point on Friday nobody knew. I remember sitting here on Friday when this thing came out, when they released the video, and I remember my initial reaction and I’m reading some of the closed-captioning on television, some of these commentators, and they’re all saying, “Well, this changes everything.” Why did it change everything? It changed everything because up ’til then they had succeeded in creating a myth that the cop had murdered this citizen. Let’s just be honest. That’s what they were trying to concoct. The cop, for whatever reasons — unstated racism — had murdered this kid. His hands were up and he was unarmed and he was surrendering and all that, and this cop just shot. So they had their narrative. They had their template. They had their version of events which fed this myth that white cops shoot innocent young blacks all the time. Except they don’t. In fact, again I say it is rare, and that’s why it always makes news, ’cause it doesn’t happen all the time. But they had their myth, and they had their evidence for the myth. And then here comes this video, which, I mean, even the commentators on the ground in St. Louis who wanted this to be exactly what the myth was had to admit, “Well, this just changes everything.” Because, remember, the time the video was released, everybody assumed the cop also knew, that he had gotten a call from headquarters, “We just had a robbery at such-and-such convenience store, suspect description is X, Y, Z.” Everybody assumed the cop knew. It wasn’t until later on Friday that we found out the cop didn’t know, but the gentle giant did. This remains crucially important. The gentle giant assumed the cop knew but the cop didn’t. Look, I’m getting repetitive here. I don’t want to bore you, but this is fundamentally crucially important. I still think it says so much. I think it opens up so many doors. It explains so much and makes so much understandable. People are outraged at a video. Here’s the governor and all these other people claiming that it led to riots. Why did it lead to riots? It led to riots because people were mad that the myth had been destroyed. Don’t forget how The New Yorker originally portrayed the suspect here. “Michael Brown was eighteen years old, walking down a street in Ferguson, Missouri, from his apartment to his grandmotherÂ’s, at 2:15 on a bright Saturday afternoon. He was, for a young man, exactly where he should be — among other things, days away from his first college classes.” And then disaster strikes. So they had created this picture of essentially total innocence and an out-of-control white cop. And then here comes video from the store, and we have a totally different picture emerge of the gentle giant. So the reason they got mad is because the original idyllic picture of innocence then gets shattered. So let’s take it out on the police chief, and don’t forget, everybody has forgotten that the media was demanding the release of this video. We’ve also learned today that the DOJ was in part responsible for suppressing it all week. Okay, so that’s Governor Nixon. Now, here’s Valerie Jarrett. She was on the radio this morning talking about the unrest in Ferguson, and this what she said. JARRETT: Our immediate goal is to make sure that the residents of Ferguson are safe, that the looting stops and that the vandalism stops. That the people who live in the community have confidence that justice will be done and that’s the president’s primary objective right now. RUSH: Okay. So the Regime’s primary goal is to stop the looting. Well, they better get on the phone to people in Oakland, because according to Marc Lamont Hill, the agitators and the looters are in town from Oakland, California, New Black Panther Party. Okay, so that’s what the Regime wants. Michael Eric Dyson, Slay the Nation, CBS yesterday, he’s a Georgetown University sociology professor. He’s on the roundtable, Bob Schieffer, and here’s what he said. DYSON: We need his leadership, his vision, his unique style. He’s an oratorical genius. Deploy that in defense of the people from whom he learned that oratorical genius and to defend those vulnerable populations, especially white people whose white privilege in one sense obscures from them what it means that their children can walk home every day and be safe. They are not fearful of the fact that somebody will kill their child who goes to get some iced tea and some candy from a store. Until that quality is brought, the president bears a unique responsibility and burden to tell that truth. RUSH: Okay, so according to Michael Eric Dyson, it is incumbent upon Obama to get out there and use his rhetorical genius on Ferguson. Now, wait a minute, now. Wait a minute here again. Hold the fort. Obama’s been using his rhetorical genius for six years. Obama used his rhetorical genius in the 2008 campaign and the 2012 campaign, so much so that people said it was genius. So much so that Harry Reid asked Obama, where’d you get this genius? And Obama told Harry Reid, it’s a gift, Harry. Well, he’s been doing it for six years. Why didn’t it work? Why didn’t six years of oratorical genius work? No, no, no, no. Don’t look at me that way. I’m totally serious. B. Hussein O. was elected, in part, to end this kind of stuff, right? Hope and change. People really thought, a lot of white voters thought that this stuff was gonna stop because that’s what them voting for a black president would mean, that the country’s no longer racist. Six years of oratorical genius, if that’s what you want to call it, and yet this stuff is still happening. In fact, it’s probably worse. But I have another reaction to this, too. I don’t think it’s true and I don’t think it is accurate to say that white parents do not worry sending their kids out of the house on errands. We comment on this frequently on this program about how parents are afraid to let their kids go do anything anymore. There’s either a purse snatcher out there; there’s a child molester out there; there’s an Amber Alert waiting to happen; there’s human traffickers out there; there are drug dealers out there, criminals, muggers, racists, purse snatchers, rapists and so forth. There are all sorts of stuff out there. How often do we talk here about how when we were kids our parents kicked us out of the house, and if we came back before five o’clock they got mad at us, accused us of being lazy. Now if the kid’s gone for 30 minutes, “Oh no! Oh no! Where’s Little Johnny? Oh, my God!” Am I right? All kinds of people are afraid to let their kids loose for fear of what’s out there. Not specifically racial problems, just there’s a lot of evil out there that a lot of parents are very worried about. They’ve been told to be worried about it. They’ve been told to be protective. Monitors and so forth. OGLETREE: I’ll tell you what. People think that three days of rioting is the end of it in Ferguson, Missouri. It’s just starting. People are upset. They’re frustrated. They want to take their city back. They don’t like the fact the police… The black man, young, are being stopped and killed. How many people have to bury young people for people to understand that something is wrong in Ferguson, Missouri? RUSH: It’s not the case! It doesn’t happen all the time. This is my point. This is further mythmaking. They don’t like the fact that the police are…? Black men are being stopped and killed? When’s the last time happened in Ferguson, before Michael Brown? Was it the day before? Was it last week? How many times last week? Was it last month? How many times last month? I mean, if it happens a lot, so much so the people Ferguson are tired of it, how often is it happening? And if they’re tired of it in Ferguson, why aren’t they rioting in Chicago? Why aren’t they rioting in Detroit? Why aren’t they rioting in Compton? What is it about Ferguson? It’s just Ferguson’s in the news today. It doesn’t happen all the time in Ferguson. People in Ferguson want their city back? Really? I don’t remember the last time it happened there. Do you, Mr. Snerdley? Do you remember the last story involving a black citizen killed by white cop in Ferguson, Missouri? (interruption) I can’t remember when it happened. It must be slipping my mind ’cause apparently it happens all the time. I just can’t remember. It must be the racist media there not reporting it, otherwise we would know.